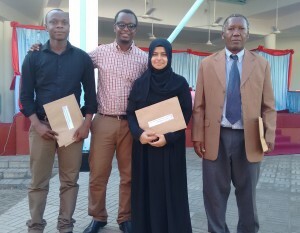 NEW YORK, N.Y., December 7, 2015 — MCW, a New York-based non-profit organization dedicated to empowering youth to become positive agents of change in their communities, has awarded two fourth-year dental students, Don Chiwaya and Fatema Alimohamed, scholarships for their excellent performance at the Muhimbili University of Health and Allied Sciences School of Dentistry. The scholarship, which goes towards tuition costs, is awarded annually to the top fourth-year male and female dental students entering their fifth and final year of dental school. To learn more about MCW’s Oral Health projects in Tanzania visit the website at www.mcwglobal.org/ohc.